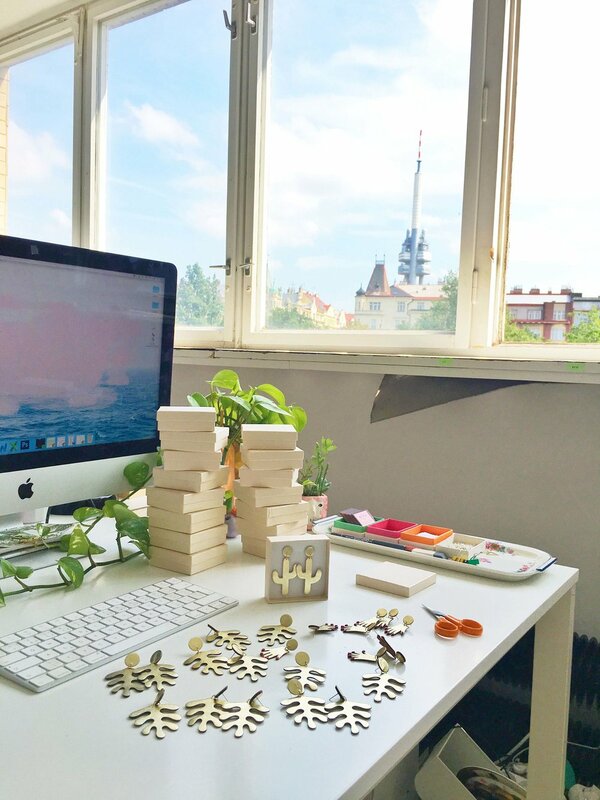 Benu Made is a jewellery brand combining bold shapes and beautiful leather textures. 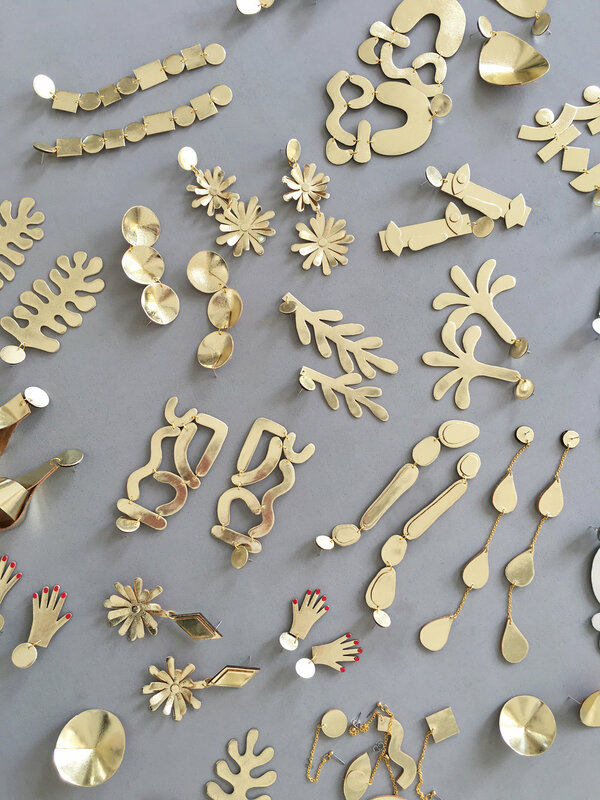 All jewellery pieces are drawn, designed and skilfully created by Pauline Hagan in her studio in Prague, in the Czech Republic. 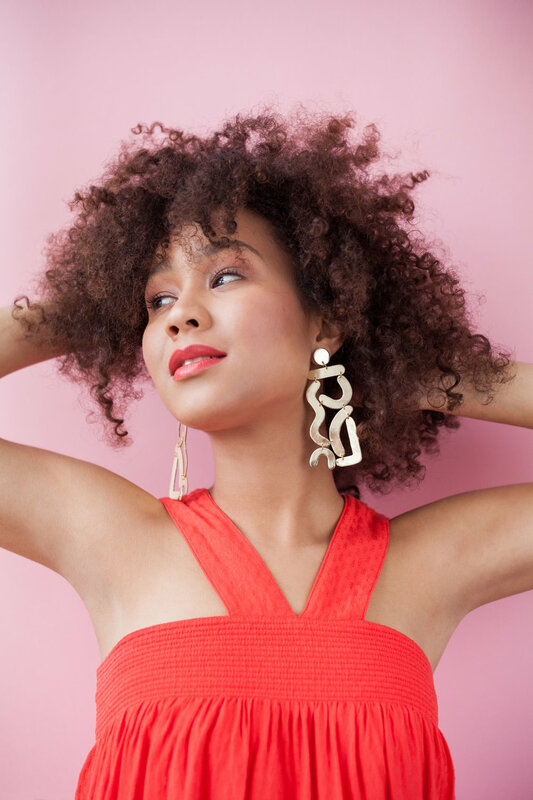 She's self-taught, and her vision is to create bold, eye-catching conversation pieces that bring personality and twist to the simplest of outfits. Check out more of Pauline's amazing work on Instagram and Facebook. The internet has been very instrumental for me. I grew up watching my mum cross-stitch and doing her best to sell her creations at markets on Saturday mornings, which would be her only outlet or sales channel. When I think about how much has changed, I question whether I would have been able to get to where I am now without the internet. Social media gives us designers and artists power - to talk about our work, to build a brand, to share ideas, to communicate with and sell directly to our customers. It enables us to be fully independent, brings us really close to our audience and encourages dialogue and community. Everyday, women from around the world tag me in photos of them wearing my jewellery, and as a designer there isn't anything more rewarding than that. However, competition is so strong and the market so saturated that it takes a really special story and product to stand out, and that's a constant challenge - though admittedly, one I enjoy! I find inspiration everywhere, by being outside, observing the shapes and details of buildings (there's an abundance of inspiration here in Prague), travelling, being in nature or during conversations with friends who’ll say 'I'd love to see this on a pair of earrings' - which might spark an idea. I also use Pinterest and follow Fashion Week shows to ensure I'm not too far off the mark and still feeding into current trends. 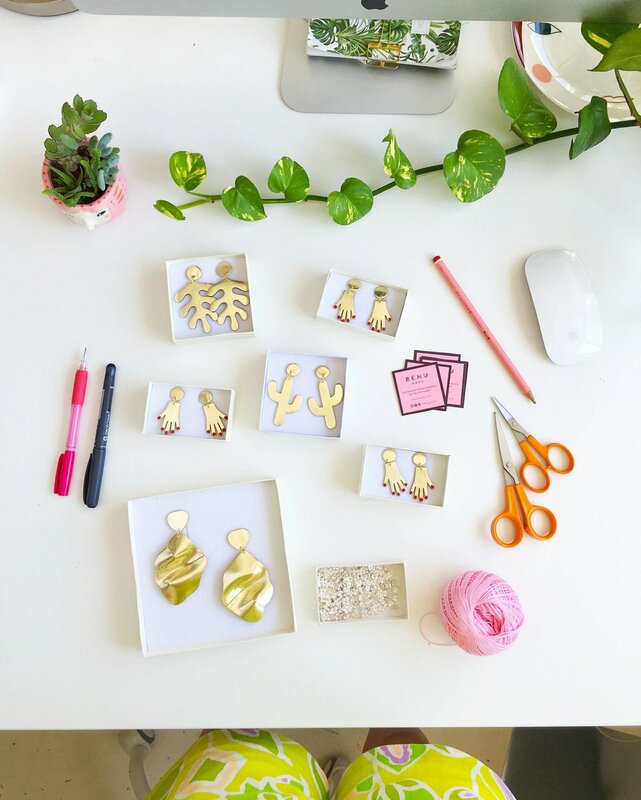 I usually design a new collection once a year, so over the course of the remaining 11 months, I gather ideas, cut outs, Pins, and notebooks full of sketches - without developing them into final products. When I revisit the ideas at the time of delving into new designs, I forbid myself from touching a computer or Pinterest for a part of the creative process. I'll take a stack of paper and explore as many avenues as I can based on those ideas - some of them may have evolved in my mind, some I'll interpret differently and might take on a new angle. Somehow, something special filters out of this process and these slowly baked ideas. The internet has impacted my design process in the sense that the overload of visual information we receive from it is overwhelming and sometimes takes precedence over real-life inspiration. This is why I try to use this 'filter' of passing time and evolved ideas to simplify things and bring them as far away from the virtual world as possible. It's been a slow process, and I've only recently felt like I've arrived at a place where I've found my creative voice and am proud of what I do. It's taken years of attempting a myriad of avenues and possibilities, materials, designs, tweaking my brand and the way I communicate - but I finally feel I've reached a certain balance and sense of harmony. The benchmark I've set myself is an eternally moving post though, so I'll have to keep up! Another aspect that helped me to find my place and voice was moving from my home studio into a shared studio over a year ago – a really cosy, creative space I’m always very happy to spend long hours working in. This move really transformed my motivation - being surrounded by successful, creative people all running their own businesses is really inspiring, as well as making a distinct separation between work and private life. I'm more than happy for others to be inspired by my work - that's a wonderful thing actually! 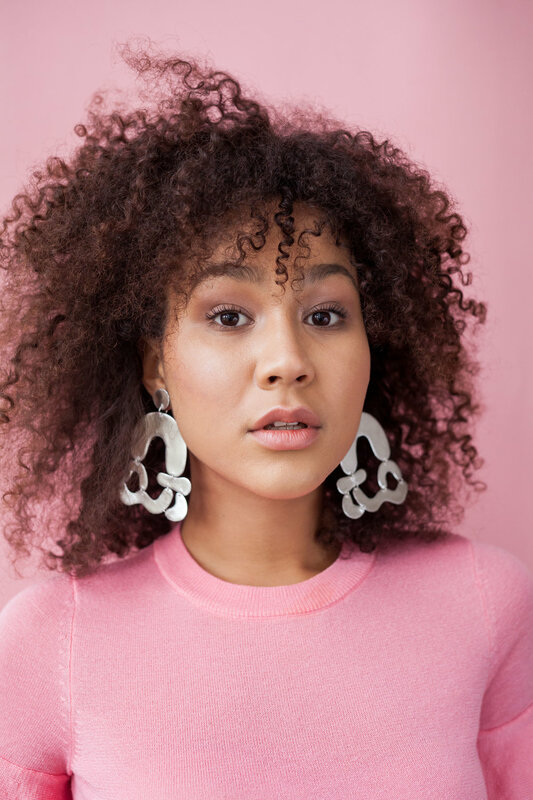 Last year however, for the first time, I encountered blatant copies of my hand earrings - and little metal, mass-produced earrings started popping up everywhere, from boutiques in NYC to markets in Europe, Instagram posts and large high-street stores. Here in the Czech Republic, a non-profit organisation helps local designers navigate issues like intellectual property. Their lawyers offer partly pro-bono work tackling plagiarism and are currently helping me counter some of the bigger players selling my stolen designs. Often, I’ll receive messages from my lovely, helpful customers or followers, who let me know of a shop or Instagram account they've come across selling the copies. When that happens, I politely write to the shop and let them know the design is stolen - sometimes, they'll be unaware of it, be understanding and take the product down. At other times, the conversation is more complicated. One of my favourite quotes is 'You are the average of the five people you spend the most time with'. I’m a big believer in surrounding yourself with good, positive, driven people. Six years ago, when I started my business, I was inspired by a new group of friends of mine who were self-employed or didn't have 'conventional' jobs. They showed me that it was possible to succeed from creativity - it’s contagious! - and I decided to follow in their footsteps. All of the following women are talented, driven artists and dear friends who work really hard and have made their crafts their full time jobs: @andsmilestudio (an illustrator), @karolinastrykova (a hand lettering artist and designer), @annanemone__ (an illustrator and textile designer) and @alishu.co (an artist and graphic designer).